It’s a Bird, It’s a Plane — It’s Super Squirrel! If you’ve ever had a yard with a bird feeder, you know how smart and determined squirrels can be when it comes to getting at the goods. But you can’t really appreciate how brave, smart and determined these critters are until you watch this video of a simple little squirrel running the most amazing obstacle course to get at some prized nuts. Really. You have to see it. Just click the image below. This isn’t a brand new video. It’s been around for a while. But Mike Thomley gets credit for giving it a tight edit and adding just the right music to make it more fun to watch. Thanks, Mike! And thanks to Larry Schatz for bringing it to our attention. There’s also a slightly longer version that begins with an observer telling us how long it took the squirrels to master the obstacle course and what happened once they did. This longer version also features some fun footage of another squirrel raiding a parking-lot vending machine. To see it, click the image above or below. If you enjoyed watching our first squirrel run that first obstacle course, you’ll probably also enjoy this BBC video of a red squirrel tackling another one. Click the image to watch it. And check out those ears! In this episode, Red Squirrel No. 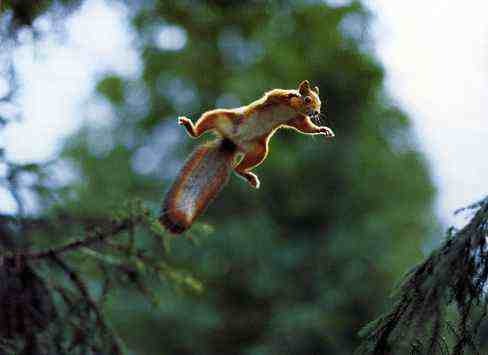 1 finally works up the courage to make a scary leap forward only after Red Squirrel No. 2 comes along and threatens to get to the food first. Squirrels, it turns out, are very attuned and quick to react to rivals and other threats. Studies show, for example, that they learn about where to find food and how to steal it by watching each other. They also use all sorts of tricks to protect their own food stores — like pretending to bury nuts in empty holes to throw off raiders. And dig this! (No pun intended!) Wherever squirrels and rattlesnakes share territory, which is lots of places, rattlesnakes hunt squirrels and squirrels have to figure out ways to avoid becoming a snake dinner. So what do some squirrels do — in California, at least? Females especially, it seems? Yucky but true: They chew on molted rattlesnake skins, then rub themselves and their babies — called kittens — with snake-scented saliva to disguise their own scent so real snakes won’t track them. If you’d like to see a squirrel doing some chewing and rubbing, click this image. The video slows down the strike-and-jump sequence the second time through, and slows it down even more the third time — and still it happens too fast to really see it! • You can read an abstract of the study on how squirrels pretend to bury nuts here and buy a book about squirrels by the same researcher here. • You can read the abstract of the study or download the entire study about squirrels chewing on snake skins here. • You can read a great piece about how amazing and fascinating squirrels are by New York Times science writer Natalie Angier here. • You can see more of photographer Andrew Bigwood’s images here. This entry was posted in Amazing Animals and tagged Obstacle course, Squirrel. Bookmark the permalink. 2 Responses to It’s a Bird, It’s a Plane — It’s Super Squirrel! LOL! Looks like me before I learned to eat like a human. Hey, everybody’s gotta eat. Love these moments. Keep ’em coming! nice site, Gini! And the squirrel obstacle course is a nice laugh on a cold morning. Would be interesting to know the obstacle course maker’s thinking. That initial leap: jeez!